It is 7:13pm on Monday, June 30 and Jeopardy is on the tv. Just as it has always been in my house for my whole life. When I was 2, I would slurped down mashed peas and hum the Final Jeopardy round theme song. But as I have gotten older, and so has everyone else, I have realized that Alex Trebek is a jerk! Now, I don’t know the man personally, nor do I know his professional aspirations, but maybe hosting a game show wasn’t his dream job. Or maybe the decades of trivia has made him cynical but whatever it is he needs to SIT DOWN! Just like a teacher who has had it up to here with misspelled 4th grade book reports and juvenile jokes. But lately Trebek has said some douche things to players that have thrown them off their game. Last week, on Friday, June 27, he taunted the returning champion saying something to the effect of “Ringing in and expecting the answer to come isn’t working for you today, is it?” It was taunting in tone and I think the producers said something to him because after the commercial break he said that the player told him that she was buzzing in before she knew the answer and it was coming to her. But it was too late. That player was taken out of her game, was flustered and she lost. And today, when the players were sharing their corny stories (99.98% of the stories shared on Jeopardy are SO corny!) And the returning champion mentioned that she met Vanna White on a flight and that she was small, he said “Like you. Slim. A very pretty lady.” She looked perplexed and bothered and she didn’t buzz in for a while. Alex Trebek is tripping and he is messing with folks minds and money! While doing research for this post (ie Googling), I discovered that when types in “Alex Trebek is…” the autocompletes are “mean” “condescending” “a jerk” and “losing it”. There is even a whole tumblr called Mean Alex Trebek, so this behavior has been documented. I just spent the last 350 words on Alex Trebek as if SCOTUS didn’t decide that my job knows more about my health than my doctor does and walking papers are still necessary if you’re brown and anywhere where folks think you ought not be, but today Alex pissed me off. So Black girls gotta check Alex Trebek. So yesterday, my brother, father and I popped into Gander Mtn, that outdoor/adventure/zombie apocalypse survivalist store. I immediately gravitated to the ugly but really comfortable sandals that my white friends wear. 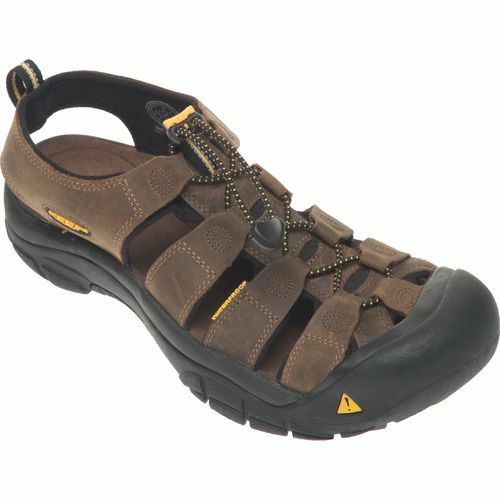 Ya’ll know ya’ll got white friends that wear these. And my 15 year old brother immediately noticed the back wall lined with guns. After walking through the shoe section (Them thangs are EXPENSIVE!) I browsed through the rest of the store until I got to the back. I had never seen so many guns in my whole life. 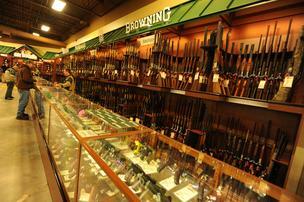 Just rows and rows of guns. I didn’t even stop I just kept walking past all of these guns. And as I was walking my heart started beating fast and my breathing quickened. I was having an anxiety attack! I don’t have a problems with guns, in fact I grew up with one in the house. My dad was NYPD and I distinctly remember the day he brought me into his room and let me hold his emptied gun and reinforced that it was not a toy. I also remember him coming home every night with his gun on his waist that I felt press against me as I ran to give him a hug. And after 9/11 we went to a WNBA game at Madison Square Garden and there were armed forces in full combat gear. I didnt understand what they were protecting us from. I still dont really. And then in college, this guy picked me up to watch movies at his house. When he got to his place, he unclipped this pink gun from his waist and sat it on the table in front of me. I was confused because I didn’t know if I was supposed to be impressed, or feel his manliness or if he was trying to say something else that he wasn’t audacious enough to say out loud. We ended up watching I Can Do Bad All By Myself and playing Scrabble. Before he put down his first word he said, “I hope that one day maybe you and I can have this,” and put down L-O-V-E. 14 points. Needless to say I beat him and I never went to his house again. I really don’t know what it was that upset me by seeing all those guns. Maybe it was thinking about the shootings in my hometown in the last year, or that the white man standing next to my brother and father at the gun counter looked like he would shoot first and ask questions later. I dont know… something just didn’t feel right.